Got an old tub? Turn it into a fairy garden. Youngsters will love this cute little garden which features low-growing plants such as lobelias and alyssum. The grass is Irish moss, says Michelle, the garden’s creator. If you can’t find that here, try our native moss-like ground cover scleranthus, or baby’s tears (Soleirolia soleirolii) instead. 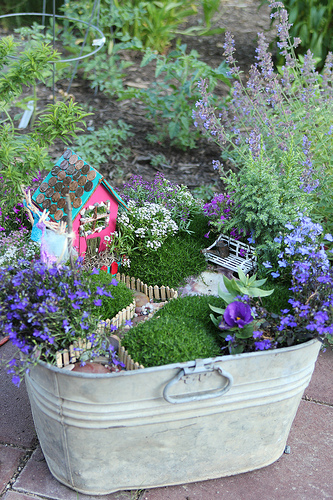 Head over to Michelle’s site Burgh Baby to see how she made the fairy house and other objects. Aren’t these the cutest containers? 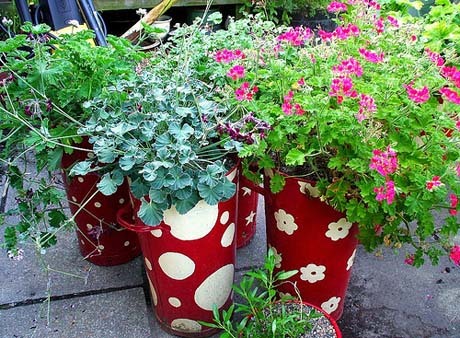 With a spot of paint, you can jazz up any old pot – be it plastic, tin or terracotta. I’m a big fan of Resene paints myself, but no doubt any paint left over from a previous painting project will do the trick. Paint a brightly coloured undercoat, then stencil a pattern in a pale or contrasting colour. These cute containers were showcased by The Vintage Cottage. 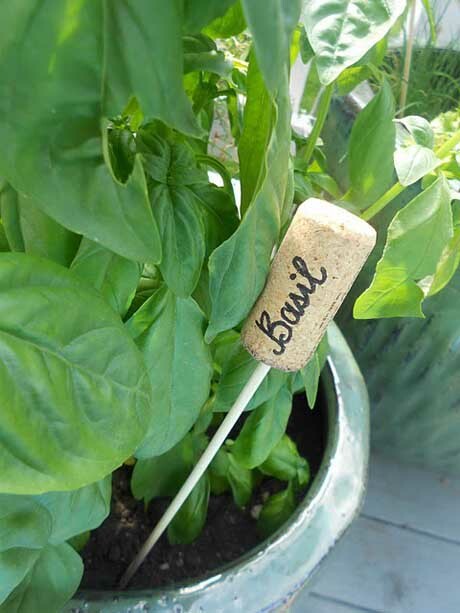 Here’s a clever idea for using up all those wine corks you’ve been saving. 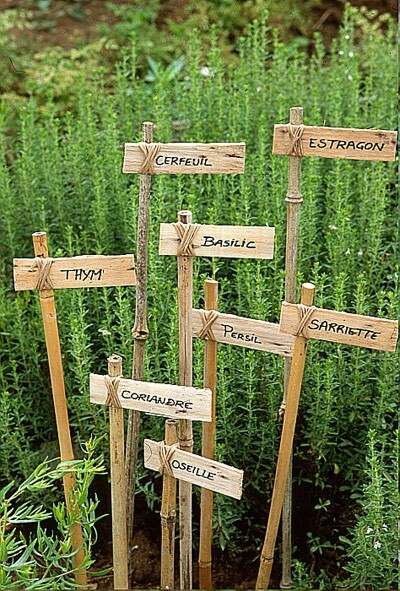 Make them into plant markers. Lisa from Shine Your Light made these crafty tags in just 5 minutes with nothing more than a cork, a wooden skewer and a permanent marker. Lisa got her inspiration from Rachel over at My Chic Life. Check them out. Introducing my latest venture… Sweet Living magazine! It’s a free online magazine offering fresh ideas and practical solutions for everyday life. There’s lots of crafts, DIYs, food, gardening, free stuff to download, and readers’ money-saving tips. 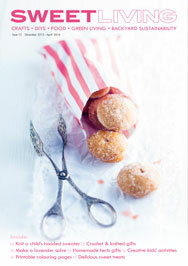 Go to the website www.sweetlivingmagazine.co.nz to check it out. Did I mention… it’s FREE!!! 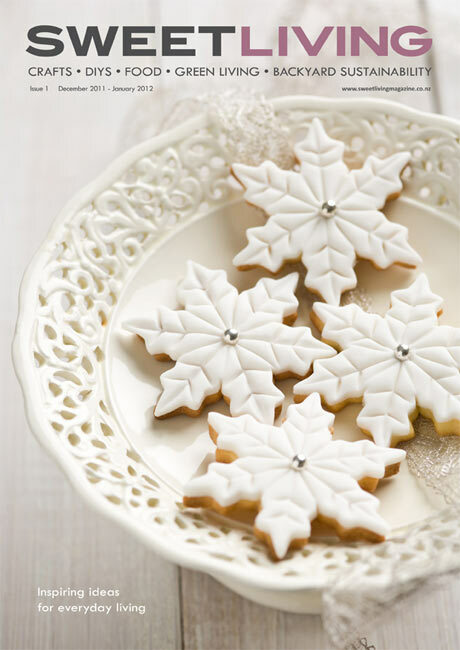 While you’re there, sign up for Sweet Living’s free weekly updates. And don’t forget to email your money-saving tips – you could be in to win! I confess, I’m a bit of a hoarder. I’m not too good at chucking things out. If the old iron bed head can be put to use as a climbing frame in the garden, then why do away with it? 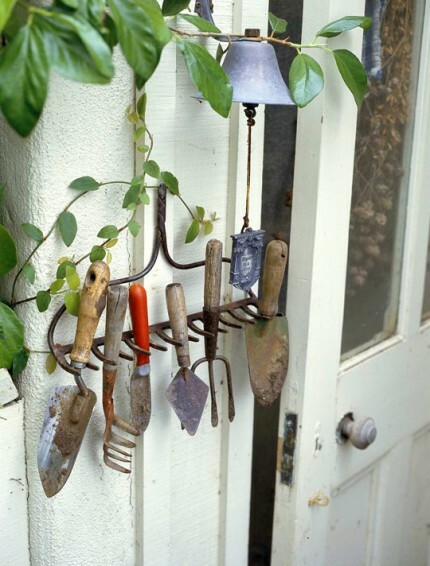 Old garden tools, pieces of scrap wood, even bottle tops can be recycled into very cool garden sculptures or tool racks. Check these out. 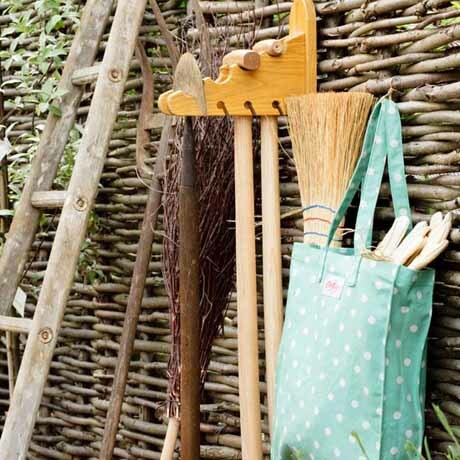 If you have a rusty old rake, screw the head to the wall and use it for organising your tools, like this clever rack over at Craft Gossip. 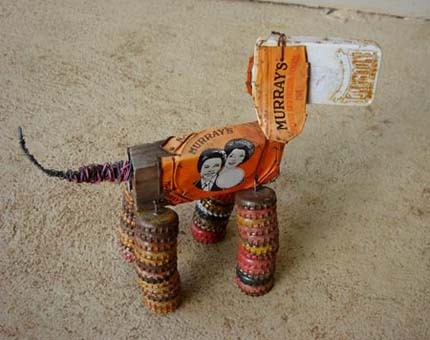 Or make a dinky-looking dog out of scrap metal, as seen here. 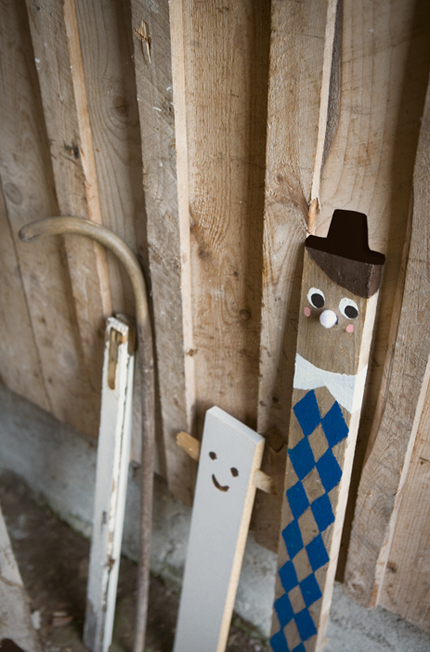 Everyone’s got garden stakes, but do they look as funky as these, over at Fine Little Day? Actually, I don’t think they’re garden stakes, but they would look great in my garden. I really like these rustic stakes. Super easy to make but very cute. 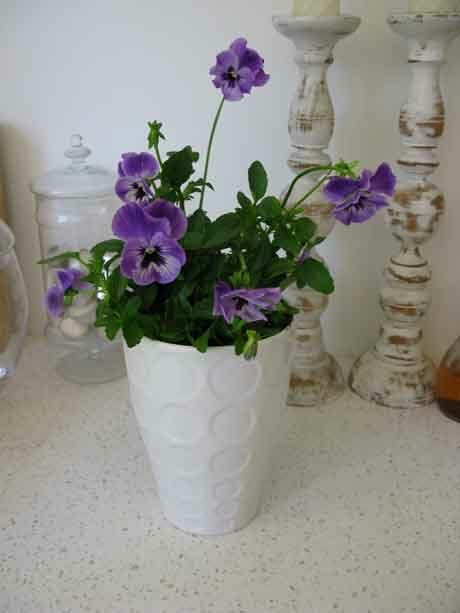 They’re perfect for the herb garden or even the flowering cottage garden. Bamboo is a strong material so it’s ideal for stakes, but you could also use small branches or other prunings. This photo comes from About Garden. Stop press! 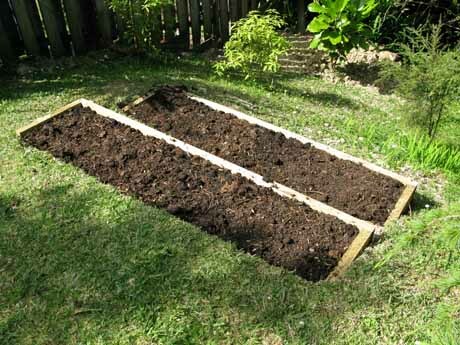 Here’s a sneak peak at the latest DIY project for NZ Gardener magazine. 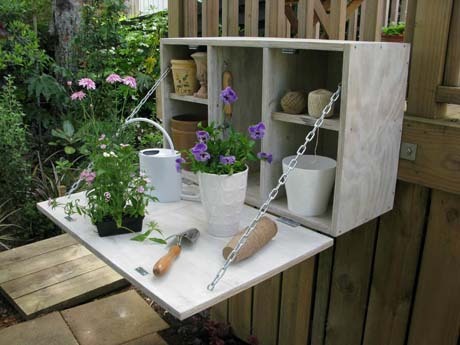 It’s an outdoor storage cabinet that doubles as a potting bench when you pull down the front panel. You’ll find step-by-step instructions in the January issue of NZ Gardener, so look out for it when it hits the shops around the last week of December. 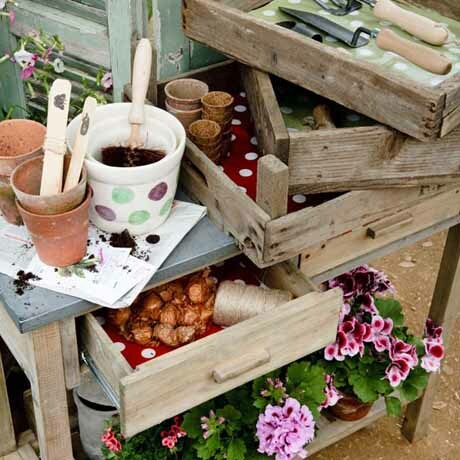 Has anyone built themselves an outdoor storage box or potting bench? 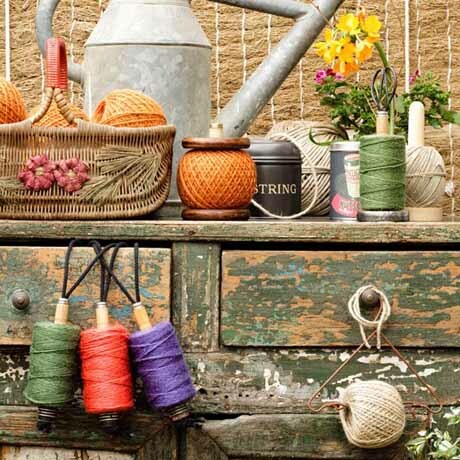 Here are some very cute ideas for storing your bits and bobs for the garden. 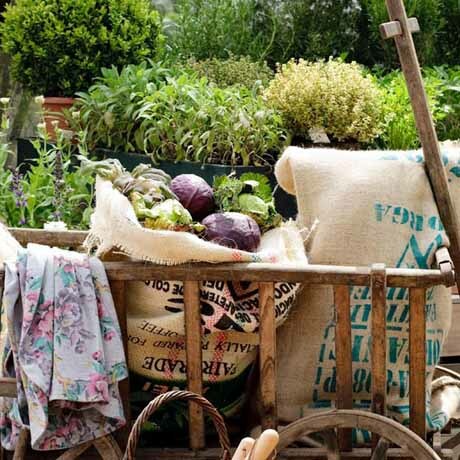 Recycled coffee sacks, old wooden seed boxes (and a very cool potting bench), lovely country baskets and old wooden crates. 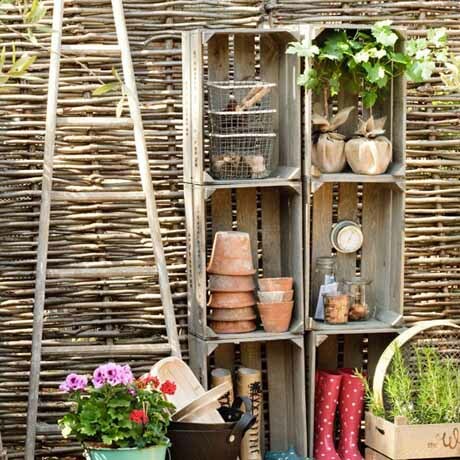 These garden storage ideas look picture perfect. I wouldn’t mind this picture in my garden. Photos from House to Home. 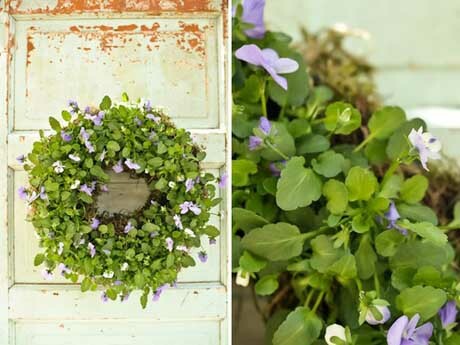 Sow yourself a tray of pansies or violas, then, once they’re big enough, plant them up into a living wreath. Like this pretty wreath from Hostess with the Mostess. It’s not quite as low maintenance as a living wreath that uses succulents (you need to deadhead this one), but it makes a gorgeous display for indoors or out. Click on over to Hostess with the Mostess for step-by-step instructions.